Hide deals from seller "Eleventh Hour"
Limit 1 per person. Blackout days: Oct. 26 and 27. Not valid with any other deals. Must present voucher and redeem tickets at will call window. Promotional value ends Oct. 31, 2012. Fall into the Halloween spirit with this spook-tacular deal for 50% off two VIP tickets to the Eleventh Hour haunted house experience in Elk Grove Village ($72 Value). Your tickets will include RIP Passes, which allow you and a guest to skip the line for all four events. Voted No.1 Halloween Event by the visitors of HauntedIllinois.com, many times over, Eleventh Hour is a premier autumn destination. As guests make their way through four on-location haunted houses, fog machines set the scary scene, and the monsters turn on their goblin skills with the intent to scare and startle you. Once you’ve recovered your breath, browse the festival area, where you can buy a pumpkin, drink hot chocolate and bask in the sites and sounds of fall. 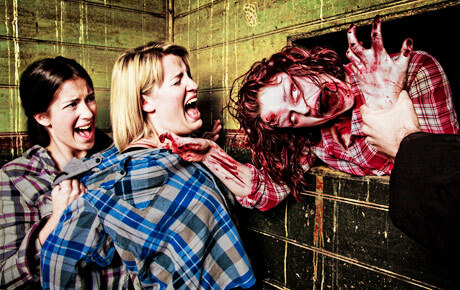 In Elk Grove Village, this experience boasts four haunted houses in one location.